For decades, drug crimes contributed to an explosion in the size of the federal prison system, far outpacing any other charges brought by prosecutors. Now, just as the federal government has pulled back the throttle on the drug war, it is embarking on an unprecedented campaign to criminally prosecute undocumented immigrants crossing the border. The result: A new wave of non-violent offenders are flooding the nation's prisons. "This is the crime du jour," said Judith Greene, director of the nonprofit Justice Strategies, which has focused on the private prison industry's growing reliance on incarcerating undocumented immigrants. "It's the drug war all over again. It's what's driving the market in federal prisons." Immigration offenders represent one of the fastest-growing segments of the federal prison population, providing a lucrative market for private prison corporations that largely control these inmates in the system. Over the last decade, revenue from the federal prison system has more than tripled for the GEO Group and nearly doubled for Corrections Corp. of America -- the two companies that dominate the private prison industry. Steve Owen, a spokesman for Corrections Corp. of America, said the company has a longstanding relationship with the federal government, and is "poised to continue providing solutions for the federal government going forward." Beginning in 2005, the government has taken a more hardline approach to immigration offenses, and prosecutors have moved to charge violators with illegal entry or re-entry, rather than simply deporting them. Those convicted can face between six months and 10 years in prison, depending on past criminal history. Because of punitive drug laws, drug offenders still make up more than 46 percent of the federal prison system, according to the Department of Justice. 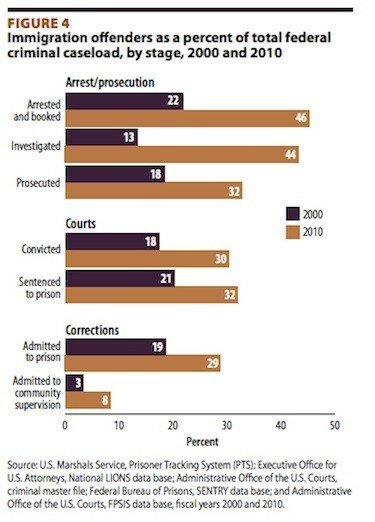 Immigrants are the third-highest category of offenders, at 11 percent. But this year, more than 60 percent of all federal criminal convictions have been for immigration-related crimes, federal data show. It's a momentous shift from a decade ago, when drug violations were by far the most common federal charge. 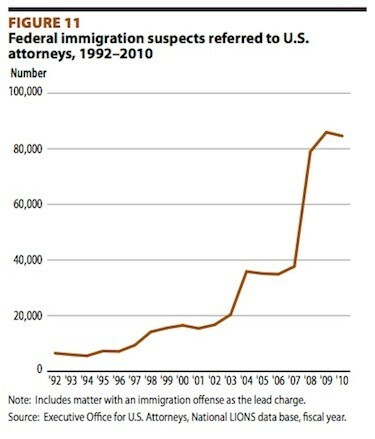 According to the most recent analysis of the federal prison population, the number of inmates sentenced to more than a year for immigration offenses increased nearly 10 percent between 2010 and 2011, while the number sentenced for drug offenses declined by about 5 percent. The zero-tolerance policy for immigration violations has its roots in the Bush administration, through a border enforcement program called Operation Streamline. The plan was designed to get tough on illegal immigration by arresting and prosecuting those crossing the border, instead of simply deporting them or placing them in a civil detention center. The increased vigilance has had a dramatic effect on the makeup of the criminal justice system. Federal prosecutors brought nearly four times as many immigration cases forward last year than they did a decade ago, according to federal statistics compiled by the Transactional Records Access Clearinghouse, a data research organization at Syracuse University. "The war on immigrants is surpassing efforts to reform the war on drugs," said Bob Libal, executive director of Grassroots Leadership, a criminal justice advocacy group. "We will not be able to reduce the federal prison population unless we stop prosecuting so many people for immigration violations." Provisions in immigration legislation passed by the Senate in June, and more stringent measures being considered by the House, would further increase arrests and prosecutions of those crossing the border. A Congressional Budget Office analysis of the Senate immigration legislation estimated that increased funding for enforcement and prosecution of undocumented immigrants in the bill would result in an additional 14,000 inmates per year in the federal prison system, at a cost of $1.6 billion over the next decade. Over the past five years, criminal immigration caseloads have surged in federal court districts along the southern borders of Texas and Arizona, leading to increased demand for prisons and detention centers to hold inmates. In Texas' southern federal court district this year, where nearly 90 percent of all new prosecutions were for illegal entry and re-entry into the United States, federal authorities are looking for more room to hold detainees, many of whom are charged with immigration crimes. The U.S. Marshals Service, which runs the jail system for suspects charged with federal crimes, has worked with the border city of McAllen, Texas, for more than a decade, paying the town to hold about 50 federal inmates in a local jail. But in recent years, the Marshals Service has had trouble keeping up with the burgeoning pool of inmates, said McAllen City Manager Mike Perez. "They kept on wanting us to house more and more prisoners," he said. "We just couldn't do it." In July, the city asked for proposals from private contractors to build a 1,000-bed detention facility with the possibility of expanding to hold 2,000 inmates. Perez said officials have already met with representatives from Corrections Corp. of America and the GEO Group, along with another private contractor, LCS Corrections. Over the past year, the federal Bureau of Prisons has also asked for bids from private companies to operate two new facilities to hold so-called criminal aliens. As U.S. Attorney General Eric Holder announced reforms to the nation's drug sentencing laws last week, an attempt to reduce the number of federal inmates held on non-violent drug charges, observers said any reduction in punishment for drug offenders is unlikely to affect the private prison industry. "If you look at where the private operators reside, it's primarily immigration," said Kevin McVeigh, a senior analyst with Macquarie Group who follows the private prison industry. "So if you think about where Holder is positioning with these reforms, it really doesn't impact them from an incarceration perspective." A spokeswoman for the Justice Department did not respond to requests for comment. Owen, the CCA spokesman, said the company takes no position on policies that determine the basis or duration of an individual's incarceration. CCA in the past has said that its lobbying efforts are meant to "educate decision-makers on the merits and benefits of public-private partnerships." GEO spokesman Pablo Paez also said the company takes no position on specific detention policies. "Our company not only provides high-quality management services in safe, secure, and humane correctional and detention facilities, but also partners with the federal government for the provision of community alternatives for both federal offenders and individuals going through the immigration review process," Paez said. Advocates for reducing incarceration argue that a true reform of the prison system must also address the criminalization of immigration. "It's great that Eric Holder is talking about over-incarceration, but the actions he's taking are not tackling the full scope of the problem," said Carl Takei, a staff attorney at the American Civil Liberties Union's National Prison Project. "There's this whole other population that's looming in the background, and growing." This story has been updated with a comment from the GEO Group.